As a relatively newly diagnosed and recognized disorder, you can help raise awareness for misophonia with misophonia awareness wristbands. Increase knowledge of the disorder can help people get treatment and relief from their symptoms. 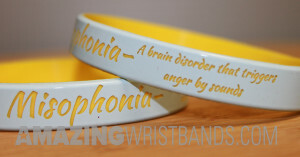 You can create and order your custom Misophonia bracelets online from AmazingWristbands.com. Use our online builder to select from a wide variety of colors, customize your message, and even add artwork. All wristbands here are made of comfortable, latex-free, and non-allergenic silicone. Does the noise made by loud chewing, rattling of plastic bags or the repetitive clicking of a ballpoint pen drive you crazy? You may have misophonia and you are not alone. Extreme sensitivity to noise is a condition known as misophonia. For those who do not have this condition, it can be a difficult to understand or even believe that certain noises can trigger such strongly negative responses from those who do. However, this condition is real and often requires treatment as it leads to social isolation and relationship problems. With recent mentions in the Washington Post and Slate, it is becoming apparent that there are more incidences of misophonia than was previously thought. Once thought as a rare condition, recent studies indicate as much as 20% of the population may have clinically significant reactions to annoying noises. Just as the prevalence of misophonia is disputed, so are the causes and treatments. Some experts prescribe cognitive behavioral therapy (a form of psychotherapy) while others insist misophonia is not a psychological problem but rather a learned condition. This latter group believes that misophonia as a learned response to what is originally just an annoyance but over time, it becomes a serious reaction leading to problems for the sufferer. They propose a therapy of desensitization. Why Buy Misophonia Wristbands from Amazing Wristbands? Get a detailed quote for your misophonia awareness wristbands in minutes!